Paleis Het Loo was built at the end of the 17th century by King-stadtholder William III. It was built as a hunting lodge and Summer Palace. 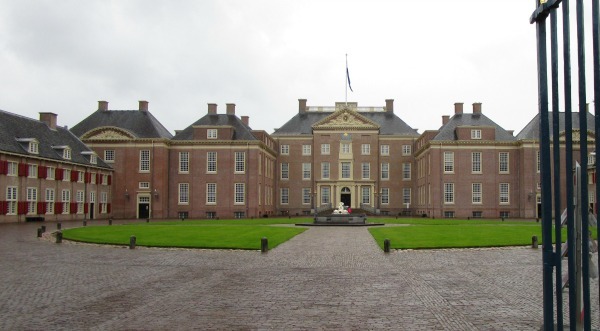 Practical information on visiting Paleis het Loo you can find here. A new palace for William and Mary. When his father-in-law was driven out as King of England in 1689, the English population asked William and Mary to become King and Queen of England, Scotland and Ireland. 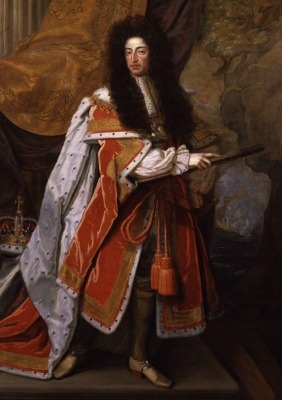 Being both stadtholder of the Netherlands and King of England, William III was the most powerful Orange ever. William married his first cousin Mary Stuart when he was 17 and she was 15. 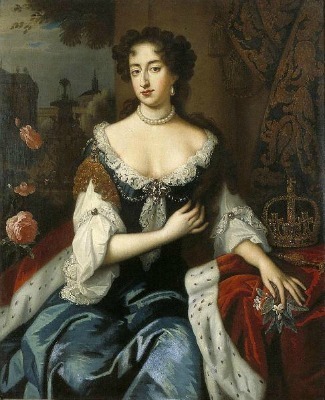 She was the daughter of the English King James II. William’s mother was a sister of this King James. Such an important monarch naturally needed a nice Palace to show off his power. The Audience Hall and great staircase of Paleis het Loo were designed to impress guests. 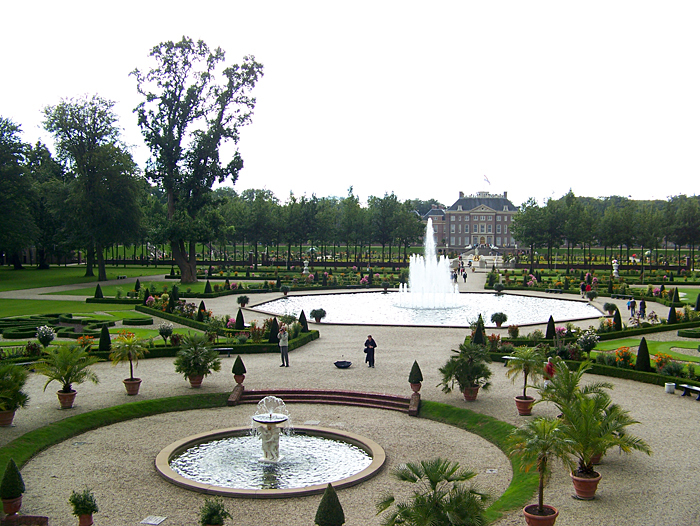 The gardens of the Palace were famous throughout Europe. William III was a contemporary of Louis XIV, the Sun King. King Louis XIV was both William’s biggest enemy as well as his greatest example. The Court culture of Versailles during Louis XIV was leading in Europe at that time. Like all European courts he followed the French fashion closely. Like Louis, he had a garden full of fountains and waterworks of which they were jealous of at Versailles. Louis was always struggling to get enough water to his gardens, William had his fountains spray thirteen metres high without any effort, higher than the ones in Versailles! For William III and his contemporaries the garden was just as important as the Palace. Garden and Palace belonged together, the garden was called the ' Buytensael ' (outdoor room). In the 17th century Garden and the Palace where known as the ' ensemble ', to make it clear that they must be seen as a whole. Another aspect that made the Dutch garden special was the contribution of the Dutch East India Company (VOC). They provided a constant supply of special exotic plants and flowers from the far East which were exhibited in the gardens. For example, tulips were still very special in the 17th century. Clothing, state dinners, parties, the furnishings of and the regime and etiquette at Court, all designed after French model. Like competitor Louis XIV, William III danced in ballets that were given to the Court. During a State Banquet the King surrounded himself with other heads of State, politicians, diplomats and influential individuals from society. Such a banquet was the perfect way to show the royal’s power and status. 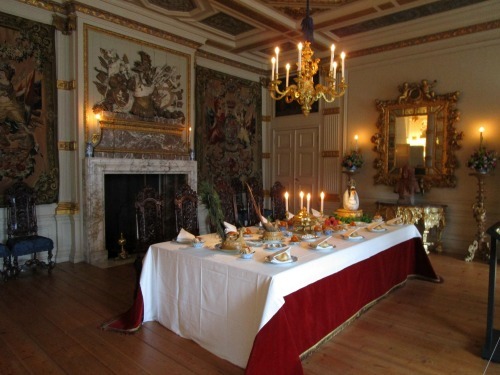 The beautifully set tables with cutlery and plates of gold, silver or porcelain, with crystal glasses and with gorgeous table decorations often remained a few days extra, so that the common people could come visit and admire all this wealth. Despite the admiration he felt for the Sun king, William III would stay at war with King Louis XIV of France his whole life. His wife Mary died of smallpox at the very young age of 32. They had no children, so he had no one to share his beautiful palace with. Another famous inhabitant of the palace was King Louis Napoleon, who was made King of Holland by his brother Napoleon Bonaparte. He was the one who created ’the white Loo’, plastering the exterior of the palace in grey-white. 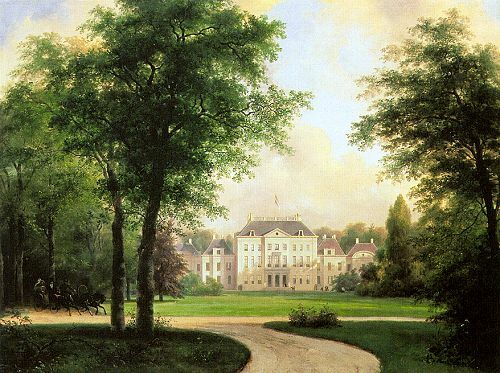 Queen Wilhelmina was very fond of the Palace, and eventually made it her permanently home after her abdication. She ordered thorough restorations and had an extra floor added. 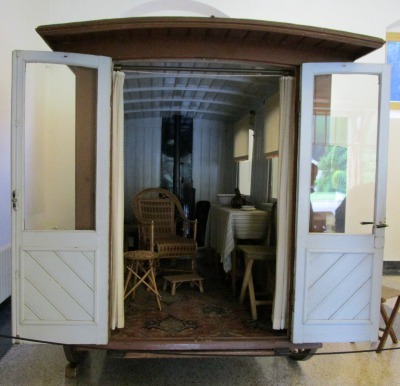 She loved to travel around in the special carriage that she used when she went painting in the area, nowadays The Hoge Veluwe National Park. Nowadays there still live royals on the grounds of Royal Palace Het Loo. Huis ‘t Loo is the home of Princess Margriet of the Netherlands and Pieter van Vollenhoven ( aunt and uncle to King Willem Alexander of the Netherlands). In the Palace you can visit the Baroque apartments of William III and Mary. 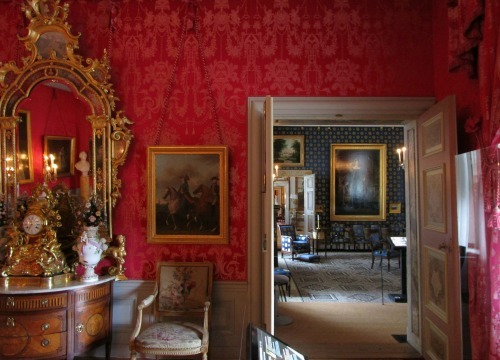 In addition, the apartments of stadholders William IV and William V, Kings William I, II and III and Queen Wilhelmina are on display. 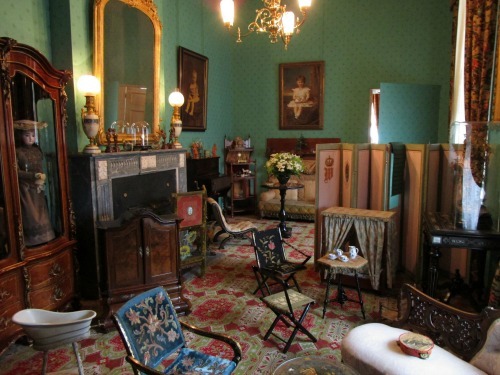 These rooms are decorated in the styles that were fashionable during their reigns, like Rococo, Empire and romance. 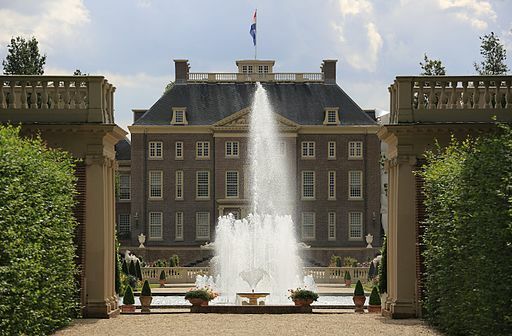 An admission ticket also gives access to the gardens, stables and the Museum of the Chancery of Dutch Orders. Opening times: Tuesday to Sunday from 10:00 am to 5:00 pm. In the stable block and Coach House are the carriages, sleds and cars of the Royal family, some of which are still being used. Eye-catcher is the white mourning coach used for the funeral of Queen Wilhelmina in 1962. On various Tuesdays in the holiday season are the Prince and princesses days. Fun if you're visiting the Palace with children! Good to know if you want to visit the Palace without children! Click here for dates. Also in the holiday season Paleis Het Loo opens the roof terrace every Wednesday, Saturday and Sunday. For a fee of only 1 EUR this offers unexpectedly wide views of the palace gardens. Tours only. You can book this at the Audio counter. coming from Arnhem (A50): exit Hoenderloo-Beekbergen (exit 22) and then follow ANWB signs.